Denise Richards, Greer Grammar, Kirk Barker, Dolph Lundgren, Jonathan Lipnicki. One of those many B-budget action shows that are continually churned out for the less discriminating audience!! The film is directed by Alex Merkin, who specialises in such shows. He also draws on actors like Dolph Lundgren and Eric Roberts. Lundgren here is one of the villains, who spends most of the time piloting a plane, but who is part of a team which is to hijack the plane in order to take possession of diamonds – a plan that has been seven years in the making but is being betrayed by the suave front man, played by Kirk Barker. Greer Grammer plays his ex-wife, a rather steely villain character, though not necessarily persuasive as a mastermind of such a scheme. However, the film opens with a hostage situation, Denise Richards as the agent trying to talk down the perpetrator, disobeying orders to try to save the life of the perpetrator and arrest him. She is angrily fired by her superiors. She finds herself on a plane to DC – clashing with a rude passenger who sits in her seat and won’t budge, being taken to first class and put next to the front man who tries to buy her off to protect him. So, a lot of shenanigans, the passengers, fortunately, seeming to be rather passive and not intruding. However, there is a flight marshal on board but is in the pay of the front man. A flight attendant who sings and dances the safety instructions is soon murdered. The pilots are then disposed of. However, Denise Richards becomes alert, conceals the front man in the hold. Various strategies, various manoeuvres, the plane finally landing in a secret airfield to prepare it for a crash in which everyone will be killed – but everyone accounted for and a false black box recording. 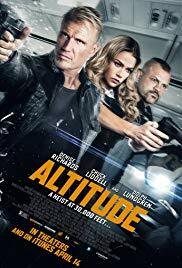 Amazingly, all the passengers are freed in record time, just the main protagonists left on board, an open door which the villainous ex-wife will go through, Dolph Lundgren in a crash landing, the other two escaping by parachute with an uncertain moral ending!